Organize your drinking glasses. 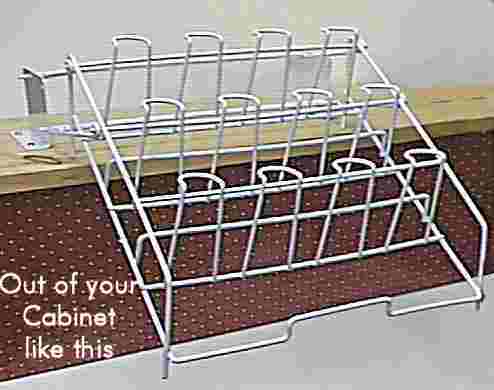 White vinyl-coated rack keeps glasses from touching cabinets, and pulls down for easy access. in a small area and makes them easy to reach. Fast and very easy installation for space saving and easy accessibility. Grab the front and it pulls out and drops down. Now the glasses in the back can be used as easily as those in the front. Sturdy and strong with a simple design. All hardware included. 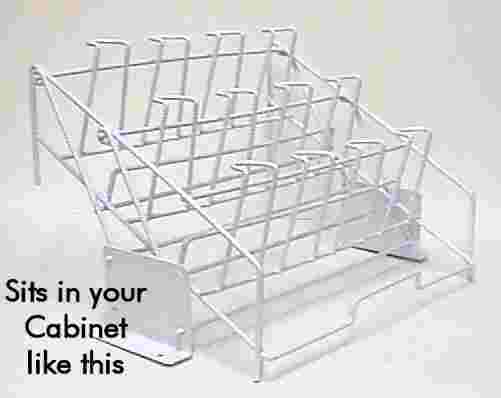 Attaches easily to inside bottom of any cabinet or shelf. 9.5"H x 14"W x 11.5"D . You only need an inch or so clearance beyond the 14" x 11.5" footprint. Glass holders taper from 1-1/2" at top to 2" at bottom. Very sturdy.